With over 100 sensors and 6.5 billion data points delivered in real-time, today the F1 is as much as about predicting the future as it is about shaving milliseconds on the circuit. In 1989, Ayrton Senna set the world’s fastest lap during the F1 Japanese Grand Prix Qualifying. His driving data of that lap was recorded and collected through telemetry system, a technology introduced to F1 by Honda. This project, a collaboration between Dentsu, Honda Motor and Rhizomatiks brings back Senna’s engine sound from that lap 24 years ago in the form of an installation set on the original Suzuka circuit that uses light and sound. Honda’s Telemetry System is a technology that transmits driving data wirelessly and analyses it on a workstation. Honda introduced this technology to F1 prior to the rest of the world. With it, many people such as engineers and drivers were able to look at the driving data, brainstorm, and share their ideas to set an even faster record during their next race. Even Senna himself always stared at the computer screen to check his driving data and see how well he did during that lap as soon as he returned to the pit. The data from Senna’s fastest lap was found as a single sheet of paper stored deep down Honda’s R&D storehouse. 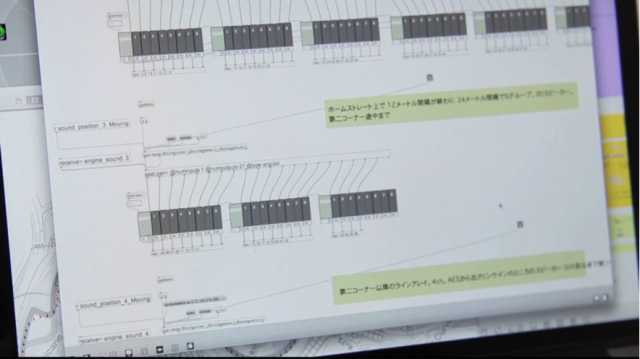 Prior to this project, some parts of the data have once been disclosed in a book on F1 technology, but this is the very first time that the complete data of the whole lap was disclosed to the public. On the paper, is a line chart showing the speed, engine rotation and accelerator. Based on this chart, a former race engineer for the Honda F1 team analysed Senna’s gear position and how it shifted. The data from this piece of paper was digitised by tracing it manually. 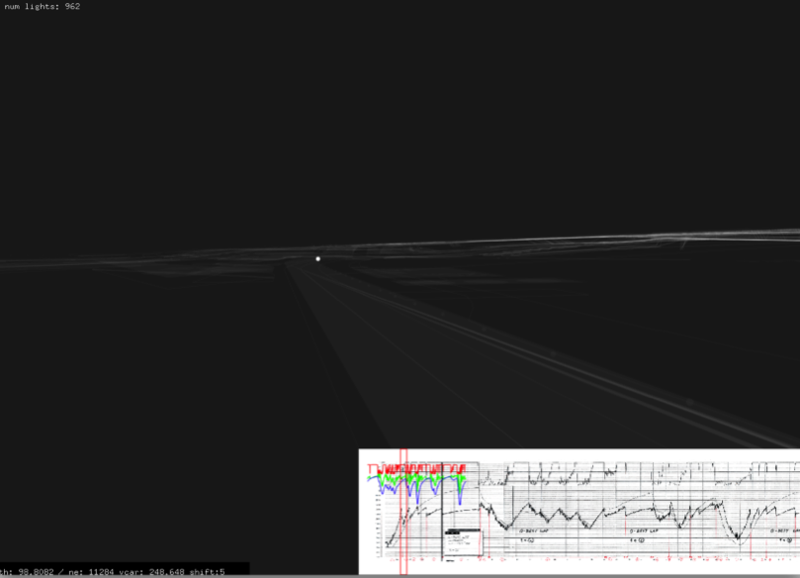 Using Senna’s telemetry data and blueprints of the Suzuka circuit, a simulator was built with openFrameworks to calculate the necessary number of LED lights that were to be place across the circuit and to eventually control the LEDs. 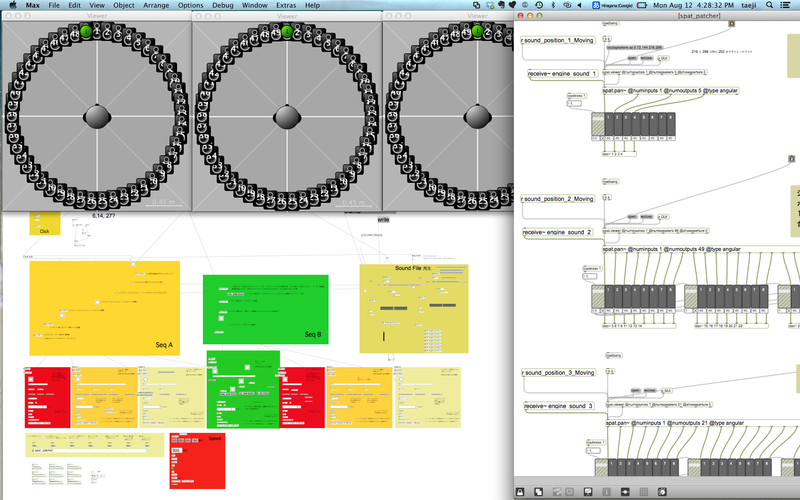 The controller (see screenshot) was built using Max MSP 6 and LEDs were installed at intervals of 10 meters. Transmitting the lighting control protocol DMX was done with Art-Net Protocol and LAN cables were extended with DLS modems NV-600LM/RM. The network was constructed by a low-cost telephone cable and normal CAT6 cable. The engine sound of McLaren Honda MP4/5 was recorded by placing a light weighted small recorder with a long lasting battery onboard the properly assembled and maintained ready to work MP4/5 machine. The engine sound was also recorded by pointing a shotgun microphone at the MP4/5 machine while it raced through the circuit. Then, these recorded sounds were made in to a library using a Sampler on MOTU　Digital Performer so that the sounds can be precisely synthesised according to the telemetry data. 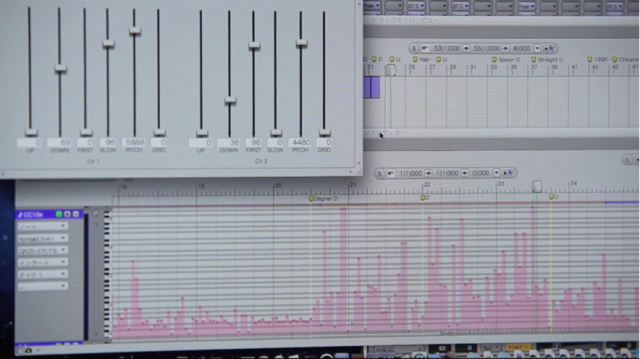 Then, listening to the sound recorded during the race in 1989, it was compared with the synthesised sound to made further accurate adjustments. The sound from each speaker is extremely short and only lasts a few hundred msec, so Funktion-One (RES5, RES4,F218,IB218) speakers that have an instantaneous force were mainly　used. 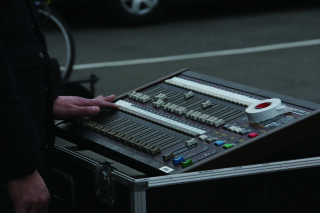 As supplementary, Meyer　MSL-4　Line Array were used. 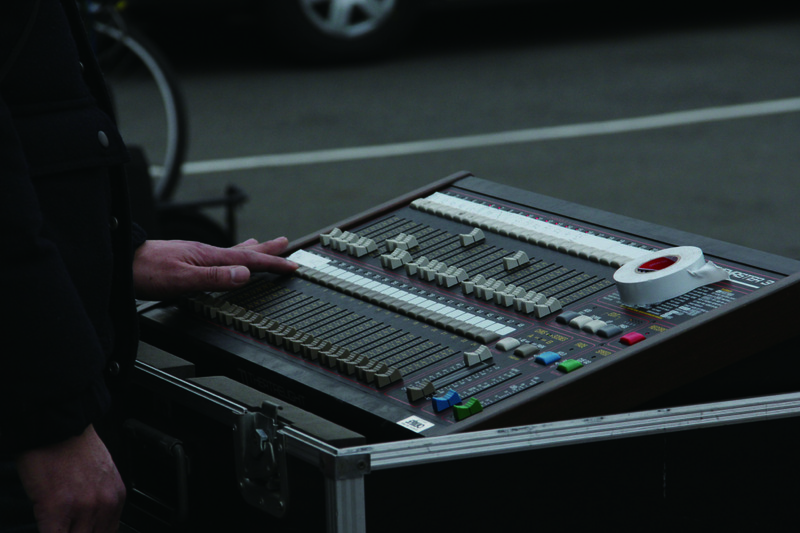 To lower the latency of transmission, digital (light) channels were wrapped up from the booth and transmitted to transit points. Then they were converted to analog and output through the speakers. 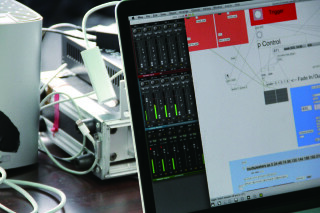 Using Max/MSP, the sound movement was controlled with numerous anomalously used IRCAM’s external object spat. The project was commissioned as a part of “dots lab” initiative by internavi. Client Supervision ：Honda Motor Co., Ltd.
Technical Production ：Rhizomatiks Co., Ltd. / TamaTechLab. / HEARTFAST Inc.